How do you feel right now? Be truly honest with yourself. Are you over feeling out of BALANCE? Are you tired of just not feeling GOOD? Do you feel sluggish and stagnant with your health? Is your body screaming for a break & time to recharge? Do you need that kick-start to achieve the body you want? Don’t worry you’re not alone.Our body has an amazing ability to try to cope with everything we throw at it; and we throw a lot at it! Until, finally it screams at us to listen. Think of what your body is telling you… Are you bloated after meals? Are you anxious or stressed? Do you suffer from headaches? Do you have low energy? Are you waking tired? Or does everything just feel off kilter? This is your body asking for a break! That’s where CLEANSE & BALANCE comes in! 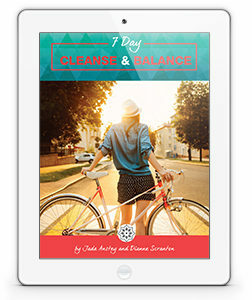 This 7 day cleanse is like no other. Designed to gently detoxify and cleanse your entire system whilst nourishing your whole being. It isn’t a fad, it’s not a typical teatox or detox, rather it is a complete program to give your system the break, the recharge, the balance it craves. As naturopaths and nutritionists, we know that to cleanse efficiently all of your body’s elimination channels need to be addressed, not just your liver! This 7 day detox will provide you with all the loving support your body needs to ensure this gentle process occurs throughout your entire system. You won’t be spending the week in the bathroom or planning your day around where the public toilets are. In fact, you’ll be experiencing what it’s like to do a great poo! Excess poo however does not mean detoxification, so we don’t want to go there. You’ll be happy to know lettuce won’t be the only thing you eat. You get to enjoy real food and lots of it! We focus on the huge variety of food you CAN eat, to ensure that your body receives adequate and correct nutrition to efficiently and effectively function. As we said, cleanse & balance is not a fad. This program will give you the recharge your body needs and the knowledge you crave, for not only short-term health but also long term well being. The Cleanse & Balance program is for everyone wanting to kick start, reboot or rebalance their health. If so, Cleanse & Balance is perfect for you! This program was specifically designed for those women wanting to take back the control of their health and wellbeing, and wanting to feel that sense of balance from within. When you undertake a complete detox program like Cleanse & Balance the changes that can occur in less than 7 days with astonish you. This is where we teach you all about the principles behind effectively cleansing and give you all the tools you need to ensure you sail through your 7 days with ease. 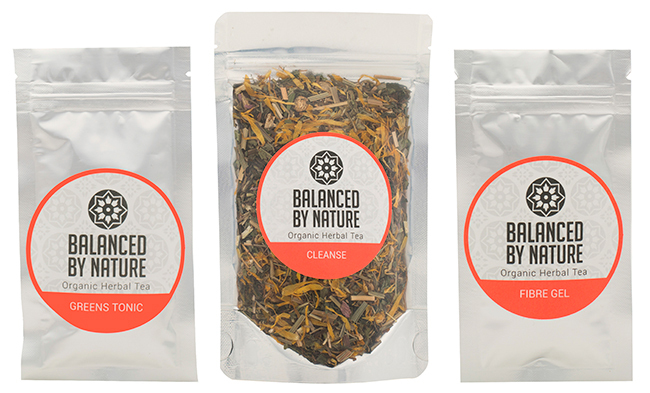 Cleanse tea is full of our favourite herbs for detoxification. This blend is designed to support each channel of elimination. For you this means: less bloating, burping and wind, healthy bowel movements, clear skin, reduced fluid retention, more energy and increased vitality. With a pleasant flavour that can lend itself to more than just hot tea, you will get to enjoy 3 cups of Cleanse tea daily. Think of Greens Tonic as a concentrated daily shot of green veg and super foods that deliver nutrients straight to your cells to power up for the day. And think Fibre Gel works just like a broom, sweeping out all of the rubbish from your digestive system. Supplementing these daily in juices, smoothies, and meals or by themselves. This duo takes your cleanse to the next level. As women we need other women to hold our hands to go to the bathroom, so why would we expect anything else when you cleanse. Join the Group Cleanse with a friend and receive $20 off your Cleanse and Balance Program! Your healthy week starts here! Yes I need my friend to hold my hand! Receive $20 off when you cleanse with a friend! Sign us up. We're in!